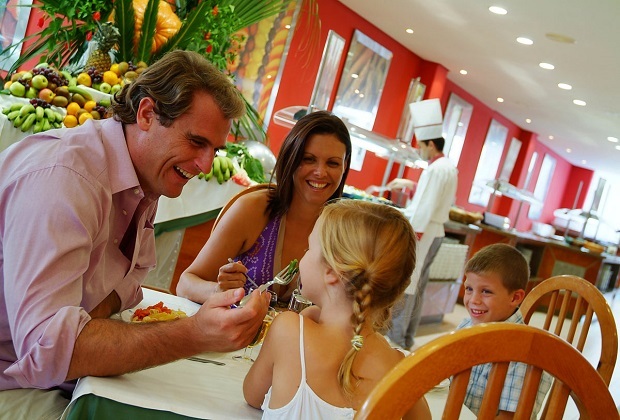 At Club MAC Alcudia, we have three restaurants serving lots of food choices for you and your family. Whether you’re in the mood for a full cooked breakfast or pancakes and fruit, a light salad or a hearty meal, there’s something for everyone. We’re particularly keen that the kids are super happy with their meal options, and make sure that we include plenty of child-friendly meals. While most people tend to dine on site for the majority of their holiday here at Club MAC, we like to encourage our guests to venture into Port d’Alcudia or Alcudia for a meal every now and again. There are plenty of restaurants, cafes and bars within an easy walk of our site, or by a quick taxi journey. Here are just a few of the best. This steakhouse is a huge hit with our guests and offers lots of choice in a relaxed, laid-bac atmosphere. There’s a play area that the kids will love, and they have their own special menu choices too. The staff are friendly and welcoming and the whole vibe is great for a fun meal out. Expect lots of meaty dishes, including kebabs, steaks and burgers, as well as pizzas, salads, fries and sides. There are plenty of reasonably priced dishes and a full, fun cocktail menu suitable for all the family. It does get very busy during high season, so it could be worth booking in advance. Another popular restaurant with Club MAC guests, Muddy’s is right on the beach. You don’t necessarily need to book in advance as the staff will always try and accommodate you if they can. There are steals, burgers, surf and turf and pizza, among many other choices on their extensive menu. Muddy’s also has a range of vegetarian and vegan options, as well as extensive cocktail menu and plenty of choice for the kids. Try the fig and honey pizza for something a little different. TripAdvisor users have voted this the number one restaurant in Alcudia, with people praising its “delicious food lovingly prepared by two friendly people”. This is the place to go if you’re a fan of authentic Italian food. It’s quite small and intimate so you do need to book, and it’s owned by a couple from Naples who brought their knowledge of Italian cuisine to Alcudia. This is slightly different from other restaurants on this list, as it has a smaller menu. However, it’s a stunningly decorated space, with every dish made with high quality ingredients and much-praised service. It’s slightly out of the way of the busier parts of Alcudia, so it’s worth seeking out. You do need to book in advance. This is a lovely place for a relaxed lunch or a filling dinner. Choose from salads, burgers, wraps and sandwiches for a lighter bite, as well as some authentic Spanish tapas. Barista quality coffee is available, and everything is cooked fresh to order. A relaxed, informal place with decent sized portions at a fair price. There are hundreds of other places to try in Alcudia. No matter your personal taste, you’ll find what you fancy. And for all other occasions you can enjoy the range we have available in our Club MAC restaurants.